Chancellor Angela Merkel is defending the development of the joint German-Russian Nord Stream 2 pipeline, dismissing American concerns it will weaken Europe's strategic position and assuring Ukraine it won't get cut off from Russian fuel. Merkel on Saturday told Ukrainian President Petro Poroshenko at the Munich Security Conference his country would continue to be a transit country for Russian gas even after the Baltic pipeline is complete. On security concerns, she says the question is "how dependent are we on Russian gas, and that has nothing to do with the delivery." She says Europe also has enough terminals to receive more LNG fuel from the U.S., has its own natural gas and has other options, too. She says "there's nothing that speaks against getting gas from the United States, but to exclude Russia is the wrong strategic signal." German Chancellor Angela Merkel is defending European powers' decision to stand by the Iran nuclear deal, describing it as an "anchor" allowing the West to exert pressure. U.S. Vice President Mike Pence accused Germany, France and Britain of trying to "break" American sanctions on Iran and called on them to follow Washington in pulling out of the nuclear deal. 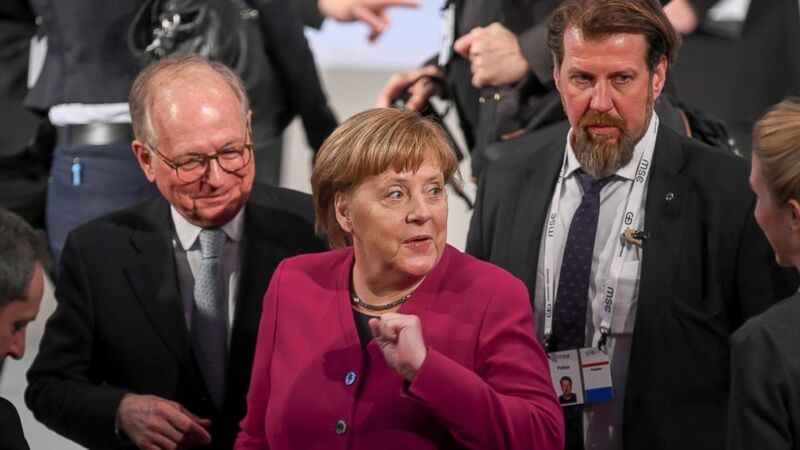 Merkel told the Munich Security Conference Saturday the split over Iran "depresses me very much," but downplayed the substance of the differences. She said: "I see the ballistic missile program, I see Iran in Yemen and above all I see Iran in Syria." But "the only question that stands between us on this issue is, do we help our common cause, our common aim of containing the damaging or difficult development of Iran, by withdrawing from the one remaining agreement? Or do we help it more by keeping the small anchor we have in order maybe to exert pressure in other areas?" Egypt's president has called on Western countries to boost efforts at tackling extremist ideology in online media and mosques. Speaking at the Munich Security Conference Saturday, Abdel-Fattah el-Sissi says countries must "tackle websites that are inciting hatred and spreading extremist and terrorist narratives among communities in the Islamic world and in the West." He also said authorities should "be very mindful of what is being promoted at houses of worship," adding that extremists should not be allowed to preach. He underlined his efforts in Egypt to control the sermons in mosques. Egypt has wide-ranging restrictions on free speech. El-Sissi also mentioned that in the terrorism context, the failure to reach a fair and final settlement in the Israeli-Palestinian conflict represents the main source of instability in the Middle East. German Chancellor Angela Merkel is calling on China to join international disarmament negotiations after the collapse of a Cold War-era treaty on nuclear weapons in Europe. Merkel told the Munich Security Conference Saturday that the U.S. withdrawal was "inevitable" because of Russian violations. But she noted the end of a treaty conceived "essentially for Europe" leaves Europe trying to secure future disarmament to protect its own interests.